Welcome to the Fulton House Bed & Breakfast…in the heart of Portland, Oregon. We are conveniently located in the southwest part of the city, one block from beautiful Willamette Park on the Willamette River, with its magnificent Willamette Waterfront Greenway. And just minutes to downtown Portland. The Fulton House is a terrific place to stay while you explore Portland or conduct business in the City. Should you wish to visit the nationally famous medical facilities at the Oregon Health & Sciences University (OHSU), you are minutes away from the tram stop that will bring you up “Pill Hill.” Or a short distance from the bed and breakfast, you will find the renowned Lewis & Clark University. 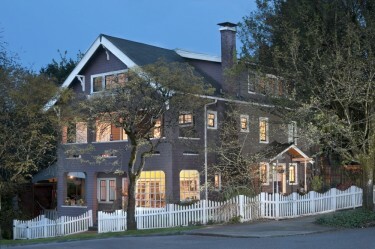 The Fulton House features a “Craftsman style” design. This late 19th century home features modern amenities: four spacious guest rooms (some with private baths), cable Flat screen TVs, DVD and CD players, free telephones and high speed Wi-Fi, plus much more. Your stay also includes a hearty homemade breakfast served each morning in our formal dining room. The main floor has a kitchen where your breakfast is prepared each morning, an “aromatherapy” gas fireplace, sun porch and a living room filled with hundreds of books and many antiques. Relax with a glass of wine on the outdoor patio or soak in the luxurious hot tub, or simply sit by the Koi pond.